quantities (Reinaerts, De Nooijer, Candel, & De Vries, 2007). “demands”) and availability (Bourges, 1994; Birch, 1998). intake to maintain an adequate diet. M. D. R. LÓPEZ-GAMIÑO ET AL. acteristic of populations with overweight and obesity problems. ary drinks, chips and fatty foods (Douglas, 1998). modification of habits in any population. other actions can be carried out under the present circumstances. degree of participation in Linguistic Conventions. poses and activities that led the intervention. curately assess the dimensions of the modifying eating behavior. participate in the study and signed an informed consent. Example of purposes and activities that guided the food education program. Noninstrumental Situational Name concepts. Name three foods containing mainly calcium. recommendations of a proper diet. ties varied depending on the level of functional complexity. of natural and industrialized foods. of them for consumption and we handed in at that moment. 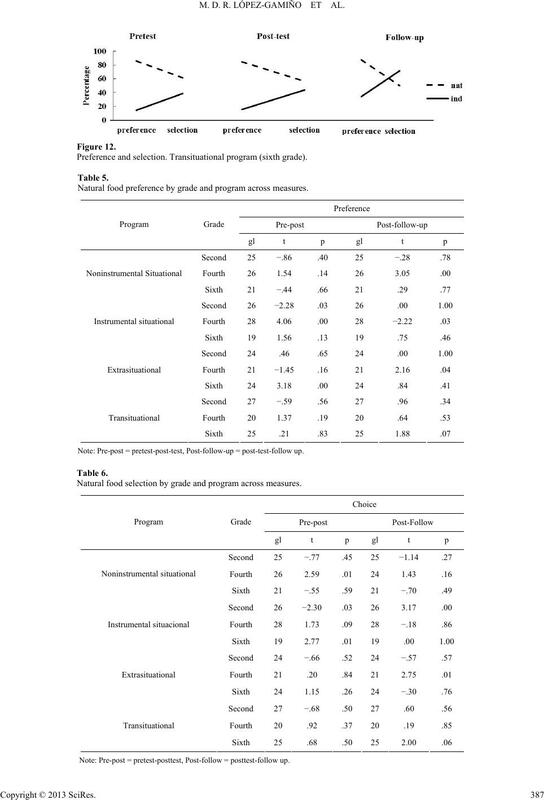 test JI2 (2 × 4) applied: X2(3, n = 298) = 4.22, p > 0.05.
to grade and educational program. what they say they prefer (see Figures 1-4). Percentage of participants according to nutritional status and intervention program. Note: Data from anthropometric measurements. Participants according to nutritional status and gender. Note: Data from anthropometric measurements taken. the level reached during the post-test (see Figure 2). ral products remain above industrialized ones in three phases. (see Table 4 and Figure 3). 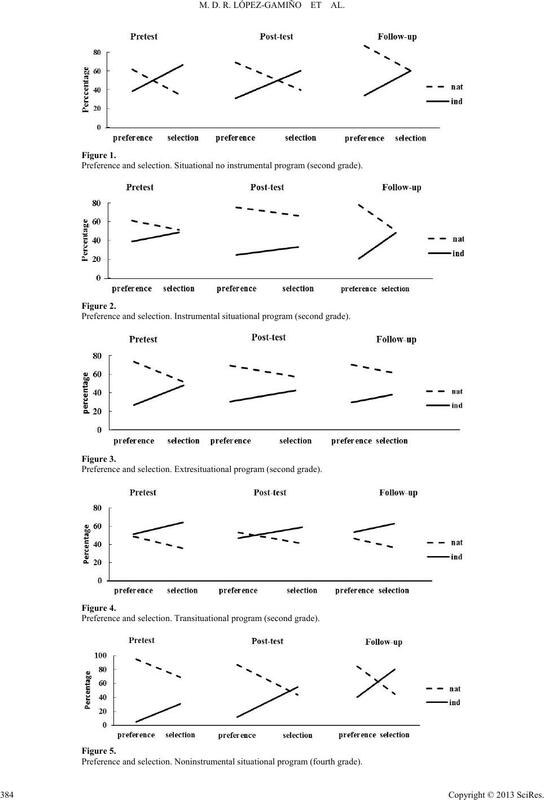 Preference/Choice pretest, posttest and follow up, in percentage. Note: Nat = natural food products; Ind = industrialized food products. Preference and selection. Situational no instrumental program (second grade). Preference and selection. Instrumental situational program (second grade). Preference and selection. Extresituational program (second grade). Preference and selection. Transituational program (second grade). Preference and selection. Noninstrumental situational program (fourth grade). Preference and selection. Instrumental situational program (fourth grade). Preference and selection.Extrasituation program (fourth grade). Preference and selection. Transituational program (fourth grade). natural products only in 54% of all cases. choice of industrial products (see Figure 7). pre-test, to 54.84% in the follow up. products but they most often select them. creases phase to phase (Figure 9). in Tables 5 and 6 respectively. Table 6 shows the results in the selection of natural products. preference and selection of natural and industrialized products. as well the perceived obstacles in the consumption of these. 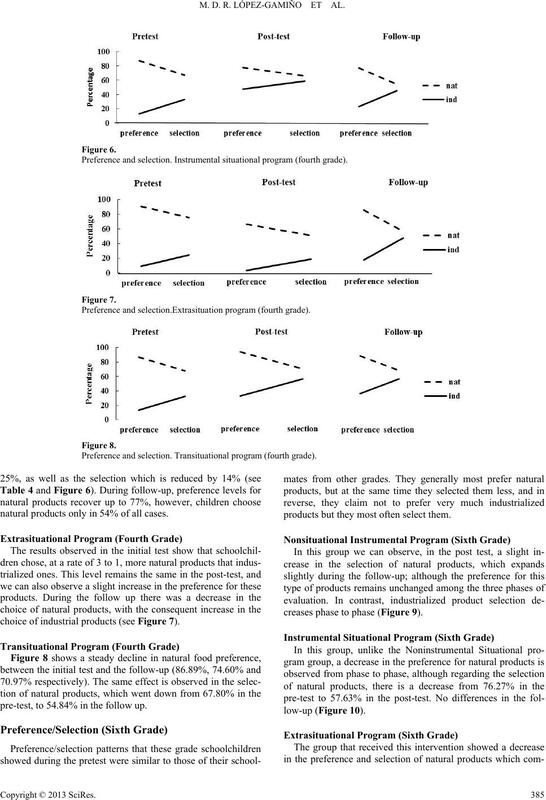 Preference and selection.Noninstrumentional program (fourth grade). Preference and selection. Instrumental situational program (sixth grade). Preference and selection. Extrasituational program (sixth grade). Preference and selection. Transituational program (sixth grade). 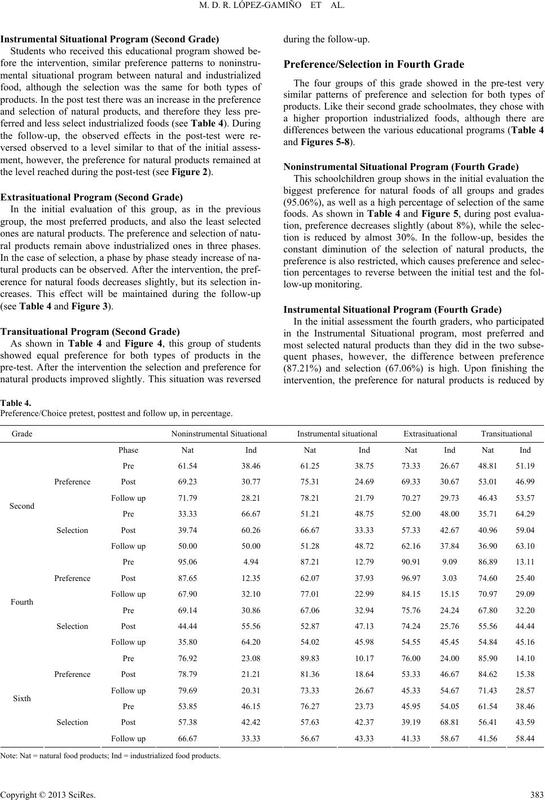 Natural food preference by grade and program across measures. Note: Pre-post = pretest-post-test, Post-follow-up = post-test-follow up. 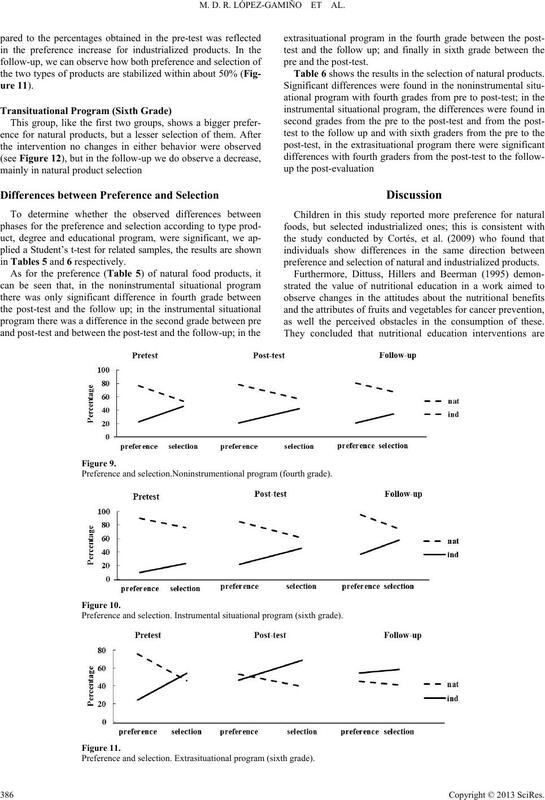 Natural food selection by grade and program across measures. Note: Pre-post = pretest-posttest, Post-follow = posttest-follow up. the alternatives to change it. the activities of the programs. tor for the modulation of their own health or disease. grams and thus, to get better results. 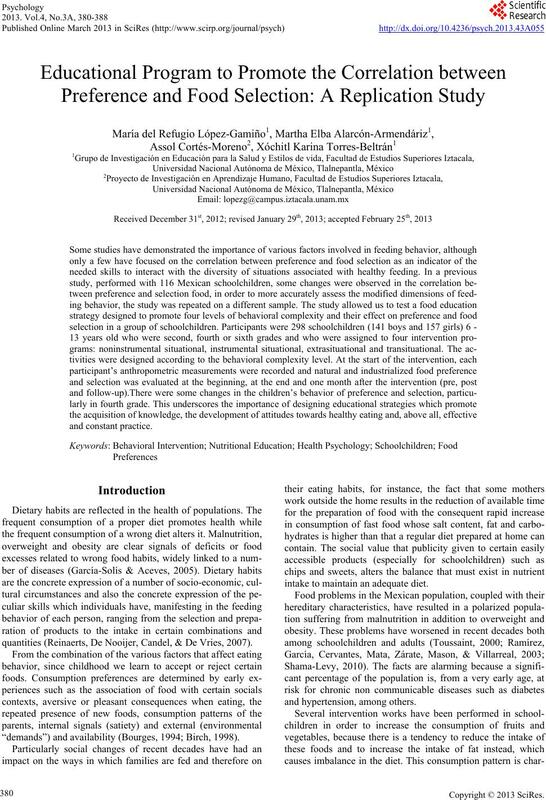 Journal of Nutrition, 128, 407S-410S. nos de Nutrición, 17, 21-28. Cortés, M. A., López, G. R., Alarcón, A. M., & Torres, B. X. (2009). Health & Social Issues, 1, 29-36.
and consumption. 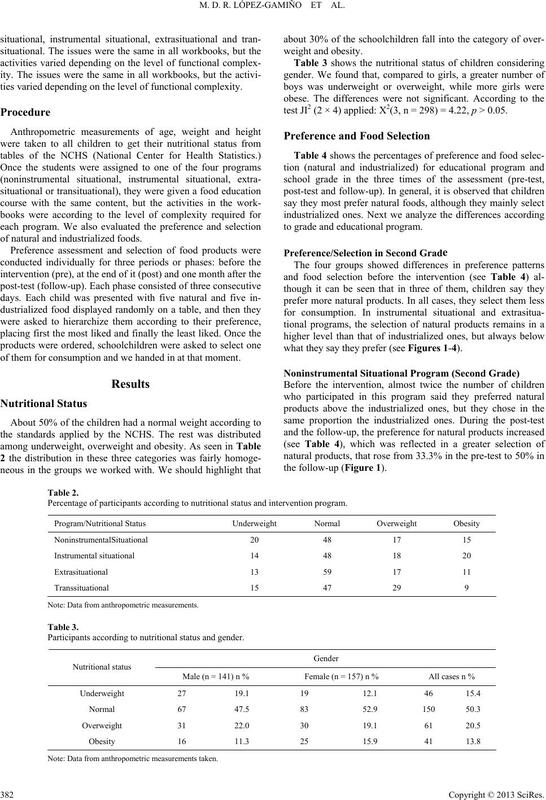 Journal of Nutrition Education, 27, 120-126. Dodds, S. M., Benedict, J., Leontos, C., & Krelle-Zepponi, N. (1998). 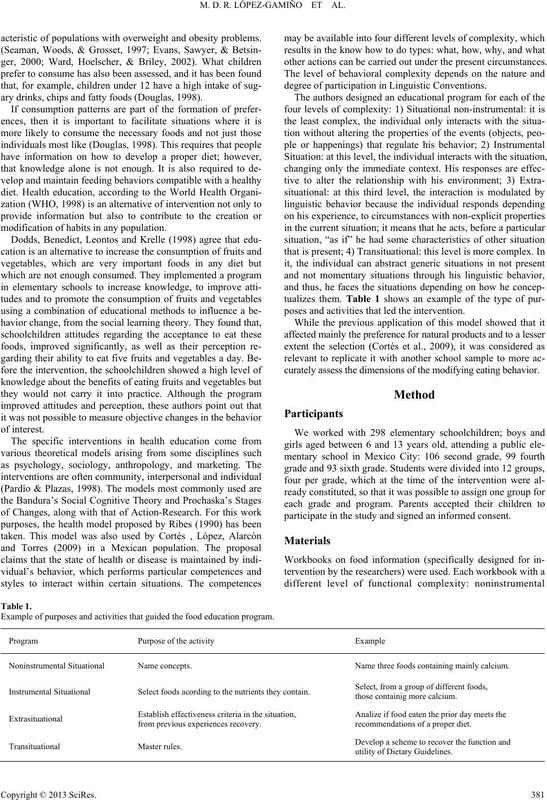 vegetable consumption among Mexican-American college students. 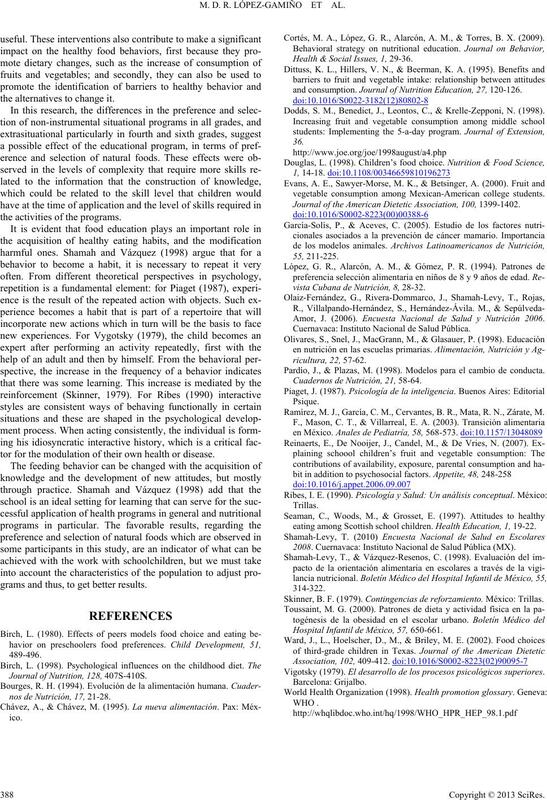 Journal of the American Dietetic Asso ci a t io n , 100, 1399-1402.
vista Cubana de Nutrición, 8, 28-32. Amor, J. (2006). Encuesta Nacional de Salud y Nutrición 2006. Cuernavaca: Instituto Nacional de Salud Pública. Pardío, J., & Plazas, M. (1998). Modelos para el cambio de conducta. Cuadernos de Nutrición, 21, 58-64. Ramírez, M. J., García, C. M., Cervantes, B. R., Mata, R. N., Zárate, M.
eating among Scottish school children. Health Education, 1, 19-22. 2008. Cuernavaca: Instituto Nacional de Salud Pública (MX). Hospital Infantil de México, 57, 650-661. Vigotsky (1979). El desarrollo de los procesos psicológicos superiores.